I spent much of the past week searching the heavens, baseball mitt in hand, hoping to catch a piece of the falling NASA Upper Atmosphere Research Satellite. The falling satellite had garnered worldwide interest the past few weeks as the public speculated where it would land, and I was disappointed to learn the UARS ultimately fell near Calgary, Canada–nowhere near Shanghai–despite the crayon-scribbled calculations of my seven-year-old son who is learning about space in school. I’m disappointed I didn’t catch anything, but I guess I shouldn’t be surprised since I’ve never caught a foul ball at a baseball game before either, although I have had players throw bats at me in response to my repeated heckling of their girlfriends. My excitement stemmed from the idea NASA would have to pay me if any debris hit me or my family. My wife, two kids, and I spent much of last week sleeping in the backyard to increase our changes of getting hit and getting paid. NASA predicted the chances were only 1 in 3,200 that the debris would hit anyone, but my seven-year-old understood this data to mean the debris would hit 3,200 people and we had no reason to question him because he’s learning about space in school. I felt the odds of one of us four getting hit were very competitive, especially when my seven-year-old calculated the world only had about 10,000 people. On Friday I read the satellite described as ‘bus-sized’, and decided maybe I didn’t want this bus-sized chunk hitting us directly, but I was hoping it would land directly adjacent to my home and become a free extension of our house we could turn into a billiards room. I don’t play a lot of billiards yet, but I might want to start if I could preface each invitation with, “You’ve got to see our billiards room–it’s outta this world!” And then once they see the billiards room is inside a satellite, they’ll love my “outta this world” joke, and if they don’t love it, well, did I mention my satellite billiards room contains a trap door dropping humorless guests into a dungeon containing the space snakes we discovered living in the satellite when it crashed? If I knew the chances of the satellite landing in our yard were so slim, I wouldn’t have spent Friday digging up my wife’s flowers to clear a spot for it behind the patio, and I certainly wouldn’t have made satellite-shaped cards inviting guests to next week’s space billiards-themed party. The invitations have already been sent and now I have to find another bus-sized satellite by next Saturday. 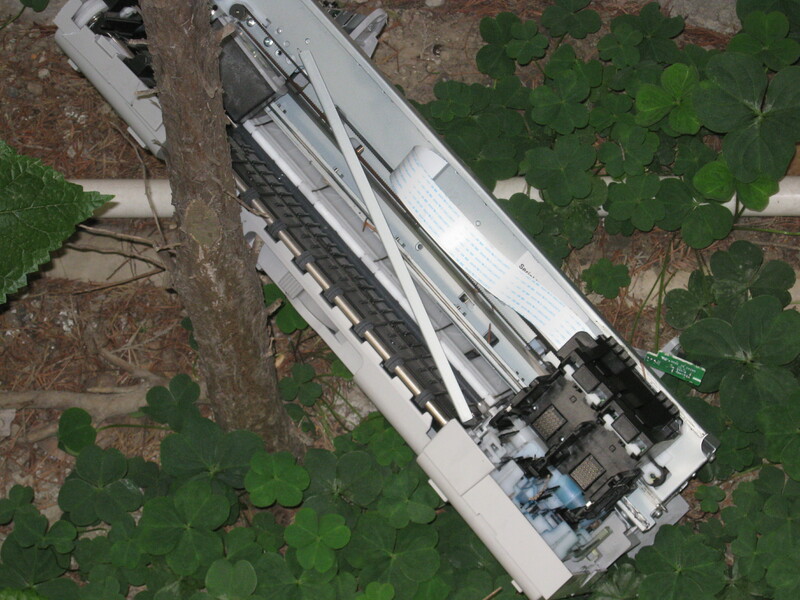 While clearing the patio I thought I had found some space debris in my backyard, but this turned out to be remnants of the printer I threw out my window in May, although I still plan to sue NASA for the damage done by its Canon Inkjet Satellite. My son thinks we have an excellent case, and we have no reason to doubt him because he’s studying space in school. 3. The house where the Jersey Shore cast is living. 4. Right in the middle of a garage sale, and nobody notices it landing and a customer asks, “How much do you want for this satellite?” And the homeowner will scratch his head trying to remember what year his in-laws had given them a bus-sized satellite for Christmas. I wondered where that thing finally landed. There really wasn’t much said about it. If it did land on my garage sale which I had this weekend, I couldn’t have even GIVEN it away. No one was buying. Maybe they were all looking for remnants of your satellite printer instead. It’s hard to have a garage sale the same weekend a free satellite is supposed to fall from the sky. How can you compete with free? I was worried that you’d hurt yourself catching space debris with a baseball mitt, but then I realized I was being foolish — of course you’re smart enough to use an asbestos mitt. I had an asbestos mitt for me but we couldn’t anything in the children’s sizes. You’re right; the trampoline would have sucked in that satellite like a tractor beam, then sent it straight back up. I thought the US Govt. retained ownership of any debris. I wonder what would happen if you used the Finders Keepers rule against them? I don’t give back baseballs when the US Govt hits them into my yard and I wouldn’t give a satellite back either. How do you do it everyday? How?? So FUNNY! Thanks. I’ll use you as a reference if anyone claims I don’t do it everyday. Yes, Thank you for letting us know that it landed in Canada but has anybody seen it? They might just be telling us that to put you off the track! I kept praying it would land on me during a job interview on Friday, but nooooooooooooo. Canada gets the glory and I had to answer ridiculous questions about my strengths (many) and my weaknesses (non-existent) and how I have handled difficult situations in the past (heavy drinking). For a job I don’t even want. Just great. I assume you’ll deal with the disappointment of not being hit by the satellite by treating yourself to some heavy drinking. As a Canadian, I’m thankful to the US for this contribution which virtually doubles our space programme. The Russians made a similar contribution a while back but at least they made it easier for us to find the debris by including a nuclear reactor with it… the search party just had to follow the tracks of the three-legged geese backwards toward the crash site. Those Russians think of everything. We’ll try and send some easily tracked contamination next time. I wish an asteroid would hit the jersey shore! I hate them and all that they stand for!!! I can safely say I have never and will NEVER watch that show. Just to be clear, you’re saying you don’t like Jersey Shore, right? I believe the US law firm of Dewy, Cheatem & Howe are already on the ground in Canada, looking for tragic victims who may not know their rights to sue….big time. What a relief to know your seven-year-old is studying space in school. Surely now the planet remains a safer place for satellites to fall and the cast of Jersey Shore to be elimated. I will rest easier tonight. I really hate garage sales. At a garage sale, you could price the satellite bus at a quarter, and someone would try and get you down to a dime. Too bad about the asbestoes. Here in Canada it’s bad stuff, and you have to wear hazmat suits if you’re trying to remove it from any buildings or homes. We sell it to other countries though. Like China. Go figure. I was kind hoping it would touch down perfectly dead center in a NASA parking lot somewhere. Oh well. There’s always the next satellite. If these are the best GOP candidates the party could offer, what would the second tier candidates look like? How can they call dibs on something they allowed to fall on my house? Space Snakes LOVE billiards, they’re the best at it, so I’m sure they’d be thrilled if you turned their satellite into a billiards room. They’d probably not even complain about having to eat the occasional humorless guest or two. I wasn’t sure whether they would like billiards because the science on Space Snakes is still in its infancy. I got my invitation today. I hope you’ve recovered the billiards room by the time I get there. I don’t handle disappointment well, at all. I’ll try and have the billiards room and the trap door ready for your visit. It would have been delightfully ironic if the ‘bus’ nailed a facility where they monitor satellites. Can you ask your son if that’s possible? Or what if it landed on a group of conspiracy theorists who feared the government was monitoring them via satellite? Oh, that would have been the best place for it to land! b)The sateillite-landing-in-Canada thing was a hoax and it actually landed somewhere in the Pacific Ocean. Actually the satellite parts did land on the Jersey Shore house, but no one noticed because the girls were having a fight and the guys were doing their hair.